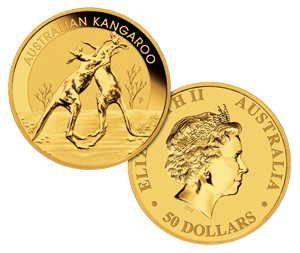 Australian Kangaroo Gold Coins are Australia's basic 1-oz gold bullion coins. Initially introduced in 1987, they were called Gold Nuggets because they carried on their reverse an image of the largest gold nugget ever found, the 2,284-oz Welcome Stranger nugget, which was found in Western Australia in 1869. However, in 1990 the Welcome Stranger image was replaced with kangaroo images, which the Perth Mint changes every year. Still, the word "Nugget" was stamped on the obverse (front) of the coins until 2008, and the coins were often called "Kangaroo-Nuggets." Now, though, the coins are mostly known as Australian Kangaroo Gold Coins. 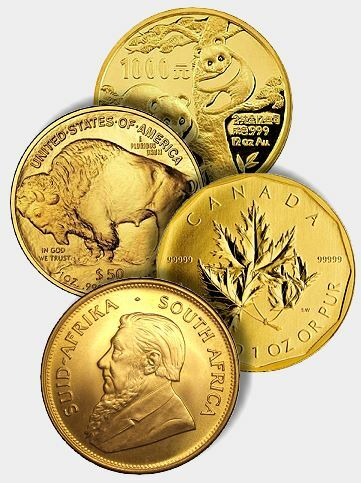 With the kangaroo design images changing every year, the coins have uniqueness not found on other gold bullion coins, such as the American Gold Eagles, Canadian Gold Maple Leafs, South African Krugerrands and Austrian Gold Philharmonics. On these four coins, only the dates, not the designs, change from year to year. 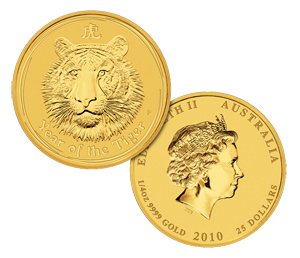 The obverse of the Australian Kangaroo Gold Coins carries an image of Queen Elizabeth II, as do most Australian gold coins. All Australian Kangaroo gold bullion coins are .9999 pure and come sealed in plastic capsules and are available in sizes ranging from 2 kilos, 1 kilo, 2oz. 1oz, 1/2oz, 1/4oz, 1/10oz and 1/20oz.